We've recently finished the main bedroom in our Country Cottage project in North Yorkshire, and the result is a haven of calm. We thought we'd share some pictures of it with you here. 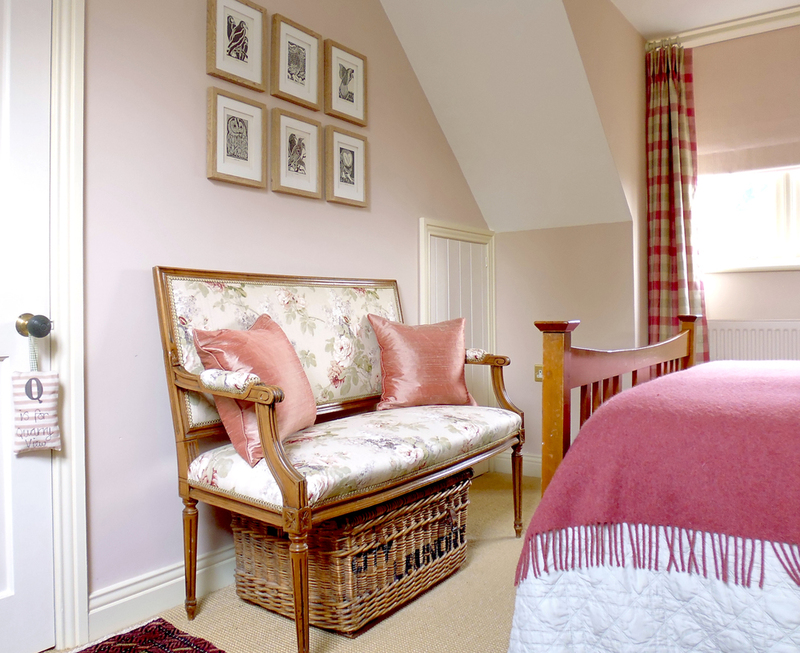 The colour scheme was lovely to work with, as the dominant colour is such a beautiful soft feminine shade of pink ( F&B setting plaster), which sets off the range of lovely fabrics used throughout the room. We designed the room using a mixture of old and new furniture to give a contemporary country feel. We combined antique pieces such as the Edwardian bed and the upholstered settle, ( upholstered in Sanderson Sorilla linen) with contemporary elements such as the BTC Hector Bidendum wall lamps and stunning artwork by Ian Mitchell. Overall the room has a sophisticated yet cosy feel , a calm, original sanctuary.... and a lovely space to lay your head.